I am grateful for Tony Cox’s latest contribution to the Shoebury sea defences debate (Shoebury Common Flood Defence Review). Whilst I will often find fault with his views on things, Tony is an intelligent debater. I miss our verbal jousting in council committees and meetings. Let me cut to the chase: I admit to having little knowledge regarding what makes for an effective defence against rising sea levels. I am not able to pass judgement on the relative technical merits of the schemes being proposed. I have no real opinion on building homes in the east of the borough beyond wishing to see the local housing shortage addressed somehow, and not wanting this solved by cramming them into the centre of town. Firstly, I do not think I have described “wanting to protect people’s homes, lives and livelihoods” as a “vanity project“. I try to pick my words carefully. However, to choose a scheme in defiance of cost is (arguably) an exercise in vanity. Tony then makes comment about the toilets. He should know that I have asked for the decision on toilet closures to be revisited – and I suggest he watch this space for developments. I hope I have been successful in my entreaties. “My decision at the time was not just on cost but other factors including aesthetics and environmental impact” writes Tony. I cannot refute that. But he will remember the debates we had. He will remember that cost was a factor for me, and for other councillors too. Costs are important – we are spending tax-payers money here. Besides, we are seeing local government finances under duress at the moment. The reasons for choosing one scheme over another are largely irrelevant to my latest contention though. I have contended that we, the council members, have been misinformed. I have yet to see anything to disabuse me of this idea. We have been presented with figures on the costs of the relevant schemes, and at every turn these costs change. This, in itself, leads to a destruction of confidence in what we are told. Not only do the numbers vary. Up to the production of the Mott MacDonald report we were informed that the council’s preferred option was the cheapest. That was the consistent message in 2013. The numbers changed, but the preferred option was always shown as cheapest. The Mott MacDonald report stands in distinct contradistinction to reports delivered when the decision on flood defences was initially made. I value the work of our officers. I trust their impartiality and their wisdom. I respect other councillors, even if I profoundly disagree with them. But, but. Something has gone terribly wrong. At the moment I see nothing but thirty-four million reasons for the destruction of my confidence. I actually hope that I have been a dullard here, because the alternative is less than pleasant. On the agenda at last night’s Place Scrutiny Committee was the Review of Shoebury Common Flood Defence Improvements. This report recommended that we note the options review document – Shoebury Common Flood Defence Review, December 2014. This document was prepared for Southend-on-Sea Borough Council by Mott MacDonald. I voted with the Conservative administration through 2013, and I explained my reasons at the time (see Shoebury Flood Defences – doing the affordable for an example). Basically, in times of constrained finances I had to vote for the cheapest option. To be honest, the costs quoted did vary at the time, but on every occasion these showed that the Council’s preferred option as the cheapest. Given that we had to improve the sea defences in the east of borough (and so ‘no wall’ was not a viable option) I felt I had no alternative. My view was supported by Labour and Liberal Democrat councillors, as well as the Conservatives. To quote from my post (written on 17th October 2013): The Council preferred scheme is costed at £4.5 million; this compares to £9.3 million for the BERA scheme and £8 million for the FoSC option. I was of the opinion that we had to have a review, there clearly was a lot of ill-feeling towards the council’s scheme by those living in Shoeburyness. However, I expected to speak (I called in the report) in defence of the previous administrations recommendations. I could not see how the facts could have changed. I then began to read the Mott MacDonald report. The executive summary included this: While the proposed preferred scheme within the PAR would have provided a functional and robust flood defence with a reasonable economic return it is clearly unacceptable to local resident groups in its current form. So far, so good. However, I then began to examine the summaries for each option. I confess to not being overly concerned to the details behind each scheme, when money is so tight one has to focus on what each one costs. This table summarises the seven schemes’ costs. The above table shows that the Council’s preferred option (PAR) is not the cheapest – far from it. It is the second-most expensive. This raises some very serious concerns, concerns that I aired last night. The first is about which set of figures to believe. Whilst the schemes deliver different solutions, when a decision is being taken based on cost then these numbers have to be right. Cost was a significant feature of the discussions we had in 2013, and on every occasion we were assured that the Council’s preferred option delivered the best value for money. I am either very stupid when it comes to basic arithmetic, or I have been misled, misinformed, or plain lied to. And not just me. This applies to all fifty-one councillors who sat in the chamber last year. This is no trivial affair. We could have spent over £34million based on duff information; £34million of tax-payers money. I could be wrong. There could be a very simple explanation. However, nothing I heard last night was in the slightest bit satisfactory. We all know that the last, Conservative, administration liked to fritter money on useless vanity projects, and this looks another to add to an already long list. Another leaflet I picked up in the recent past was produced by an organisation called Sustainable Aviation. The leaflet talked about cleaner, quieter and smarter aviation. The claims are that they can deliver growth in UK aviation to 2050 whilst taking net CO2 50% lower than 2005, they can achieve quieter skies than 2010 despite increased air traffic, and that sustainable fuels have the potential to contribute £480 million to the UK economy in 2030. The following comes from their blub that I picked up recently. • There are 80,000 warehouses in England and Wales. • On average there are 621 fires in warehouses each year – 588 are in warehouses without sprinklers. • 996 jobs are lost annually to warehouse fires. • The UK has the least rigorous requirements for sprinkler installation in warehouses compared to competitor economies. • 135,000 tonnes of carbon dioxide are released into the atmosphere annually as a result of fires in unsprinklered warehouses. • Between 25 million and 18 billion litres of water are used to fight all unsprinklered commercial and industrial fires, nationally, per year. • Only 4.3 million litres of water would be used per year to fight these same fires if the buildings were protected by fire sprinklers. This certainly is food for thought. I guess the news that Cllr Marimuthu Velmurugan is again considering his allegiances is not really news at all. He writes in the October 7, 2014 editon of the Leigh and Westcliff Times (issue number 813, Letters, page 66) that he is “ashamed to be part of an administration that has allowed this to happen“. He refers to the waste collection contract negotiations that have seen Cory fail to be shortlisted. In reality the process was begun by the Conservative administration (led by Marimuthu’s beloved Cllr Holdcroft) and has been continued by the current administration. With enormous cuts being forced on the council by the Government one has to imagine that savings are being looked as regards to waste collection. Cory are a small company that cannot offer the economies of scale offered by its rivals. I might have liked to imagine that this could be handled by the council, in-house like the days of my youth. Those days are long gone. Now that we have free enterprise involved then the market must dictate. I am puzzled as to why he feels ‘ashamed’ – he can disagree, many will, but ashamed? Really? 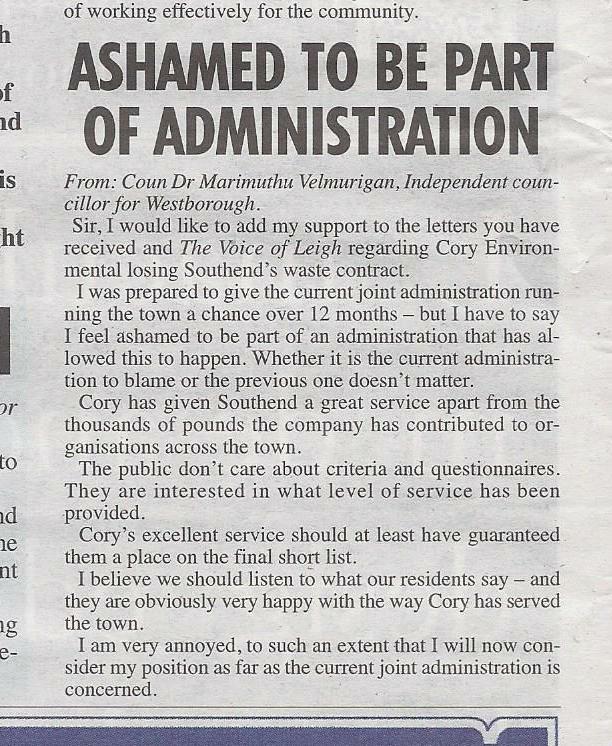 If he insists that Cory is retained, and they prove a more expensive option, I would invite the Westborough Independent councillor to suggest what should be cut to make this happen. In the meantime his residents must be wondering how many more political coats he will be wearing. He was initially elected as a Labour councillor, jumped ship to become an Independent, then joined the Independent Group. Later he fell out with them, becoming a standalone independent, and most recently he re-joined the Independent Group (despite publicly declaring himself a Conservative minded Independent). Sometimes in politics you have to take tough decisions, are faced with unpleasant choices, and have to compromise.